We had a full calendar of Airbnb guests, I launched my new doula agency, and I started the preparations/nesting for Adelaide, all while trying not to leave the couch. Thankfully, my contractions died down and Adelaide stayed put. But I really forced myself into as much bedrest as possible. I did not want to have a preterm baby in the hospital, and I am so relieved that we are out of that window. It's been so surreal getting all of Genevieve's newborn clothes out and rearranging the nursery to make room for another baby. I feel very settled and ready now that my birth kit has been purchased, the co-sleeper is set-up, newborn diapers and all my postpartum supplies are here, I had my blessingway (can't wait to share about that! ), and the car-seat is installed. Nesting mode is taking off. These upcoming weeks will be filled with cleaning, straightening, organizing, downsizing, and getting ready. Luckily, a spot opened up in a local Parents’ Day Out program and Genevieve started going to 'school' every Tuesday and Thursday. This really helped me get rest during the week. My community of support is incredible. I have had help with Genevieve every day and I was able to rest and get the work done that I needed to before transitioning into my maternity/waiting season. She cried the week first of school and so did I. It was so crazy dropping her off with her lunchbox, backpack, and sleep mat. It seems like she aged so many years just this month. Although the drop off was tough, her teacher said she did great adjusting. Genevieve loves routine and schedules so I knew she would really grow to enjoy going to school. And she has done so well since then! In her first week she also had school pictures. They are hilarious! I really felt like I upped my mom role when I went to her first Christmas program. She "sang" 'Go Tell It on the Mountain' and 'Nine Little Reindeer'. It was absolutely adorable. She has been singing those songs every day since. This last month she has been so delightful to be around. She says "thank you, mama" and "please", shows more restraint when having to wait patiently, doesn't cry at every person who comes into the house, and is talking up a storm! I love being her mom! I love the holidays! I love getting to spend time with family and having Michael off work. Christmas this year was bizarre: it was 70 degrees and rainy. Not the white Christmas I've always dreamed of but Genevieve loved playing with her Dada and uncles in the rain. This year, more than any other year, has been so fun because she is actually engaging with the presents and traditions. It will only get more and more fun from here! And it's crazy to think that Adelaide will almost be one next Christmas! My dear friend Carissa took these beautiful pictures of my family before Adelaide arrives. Unfortunately, getting a good picture of Genevieve is near impossible. She screamed every single time the camera was put in her face. But it's part of the story and the season we are in, so we pushed through. I can't believe our next family pictures will have another baby! November has been a crazy month. -Our baby girl turned 2! You can see her birthday party here. -Michael and I went on a babymoon to Cincinnati where we ate so much great food. Here is the blog post from the trip. -I finished my last birth as a doula before preparing for my own delivery. -And I announced the grand opening of Nashville Doulas! The last 5 months have been packed full as I started a new doula agency with 2 other partners. I've been putting in 60 hours a week and working non-stop to get everything prepared. -We got our co-sleeper set up in preparation for Adelaide, and Genevieve has loved using it as her crib for her baby doll. She is practicing being a big sister and it is so sweet! -We also got our house all ready for Christmas. I think it's so magical to celebrate holidays with a toddler. We had hot chocolate tea parties, made orange garlands, lots of cozy cuddles, and decorated our Christmas Tree. -I was feeling pretty discouraged with Genevieve and her tantrums, but the last few weeks have been so much better! I watched the video, "Happiest Toddler on the Block" and I learned some great tools to communicate with my toddler. We seriously cut out 100% of tantrums. I feel like we are really starting to understand each other and it's just getting to be so much fun! Every day she says new words and the ability to communicate has changed everything! -This month we also found out that my body is starting to show signs of preparing for labor. I was feeling so many cramps and Braxton Hicks and I just sensed that something was a little unusual. I felt so pregnant even though I was just in the beginning of the 3rd trimester. It felt like the end pregnancy. So after my prenatal visit we discovered that I am making cervical changes. And at 31 weeks, it is not so ideal. So I am now taking it VERY easy. I can't have a home birth if I go into labor before full-term at 37 weeks. I am not on bed rest but I have cut out just about everything I can so I can take December very easy. Little Adelaide must stay put for one more month!! 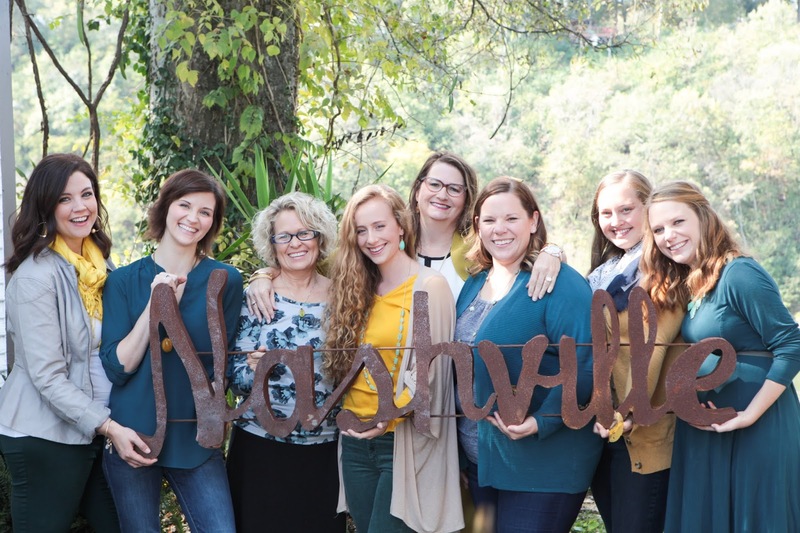 I love this amazing group of women and I can't wait to fully launch and start supporting Nashville's pregnant mamas. We had a minor scare this month. I am so excited to meet you but I know a few more weeks will only help you grow nice and big. I would love to welcome you earth-side in the comforts of our home, so please hang in there for another month. Your movement is so intense right now that I feel like I can hold your hand through my skin. And I now know that your most active time will be around 7-10pm. That will be daddy's shift once you arrive ;) Oh sweet girl, we are in our final weeks and I am savoring each and every day.